Thirty-two nations send teams to South Africa. Only a handful of the teams have a realistic chance of winning. There have been only seven different winners of the World Cup: Brazil, Italy, Germany, Uruguay, Argentina, France, and England. There might be a new member of that exclusive club this year, although don't bet much money that it will be the United States. The big media outlets have embraced the World Cup as an event of Olympian proportions, although you can bet on reading more than a few "This game is so boring" columns from sportswriters throughout the United States. The question of why someone watches something that they dislike so much is never answered. ESPN is advertising the event relentlessly and Sports Illustrated is augmenting its regular soccer coverage by Grant Wahl with the likes of Joe Posnanski and Peter King. And Nike's commercial for the World Cup is a work of art that no Super Bowl commercial can hold a candle to. ESPN and ABC will be handling the English language coverage for the United States. Univision and Telefutura will be the Spanish language outlets. Matches will start at 4:30 am, 7 am, or 11:30 am in the Pacific Time Zone (South Africa is nine hours ahead of Los Angeles.) ESPN is opting to use British announcers for its coverage, which will give the matches even more of a foreign edge to them. In the past, ESPN has tried the jingoistic Jack Edwards in 2002, known for screaming "Mine eyes have seen the glory!" after the U.S. win over Mexico in the second round, and a baseball announcer, Dave O'Brien, in 2006. Presumably, ESPN feels that we'll take English accents more seriously. As for me, I like to switch over to Univision to watch some of the action. (Also if you don't have cable, you can still watch the matches on Channel 34) I fell in love with the World Cup in the summer of 1982, when the tournament was held in Spain. During my summer vacation from school, I would watch all the matches I could with a blurry UHF signal. It certainly did improve my Spanish. Perhaps not in a practical way, but I still am tempted to yell "fuera de lugar" instead of "offsides." You can also catch streaming feeds of the matches on ESPN3.com (which not everyone gets) or in Spanish on UnivisionFutbol.com. There are countless places online where you can find a sophisticated analysis of the World Cup. Each team has been dissected thoroughly by soccer experts. I will give my extraordinarily unsophisticated preview of each of the 32 teams arranged by their eight groups. The top seven teams in the world (by FIFA's BCS-like ratings) and the host nation, South Africa, are the top seeds in each group. The remaining 24 teams are then placed (with some randomness) to even out the geography and quality of each group. South Africa is the top seed in this group because they are the host. However, South Africa will be lucky to avoid the ignominy of being the first host country not to make it out of the first round. The Bafana Bafana (which you have to admit is a pretty good nickname) have not impressed against top flight competition. In the 2009 Confederations Cup played at home, South Africa beat New Zealand, tied Iraq, and lost to Spain. The best, or worst, part of any South African match is listening to the vuvuzela, a plastic horn played constantly through matches. It can be beautiful or incredibly annoying. You decide. France was the runnerup in 2006 to Italy, losing on penalties after star Zinedine Zidane was sent off for headbutting an Italian player. Zidane is retired and what was left of the French side barely qualified for the tournament, scoring a controversial goal against Ireland set up by a hand ball by Thierry Henry that wasn't called. France is an old team with an unpopular coach. But, I still think they will get through to the second round in a very ugly way. Uruguay won the first World Cup in 1930, when it was the host, and then won again in 1950 in Brazil (where the 2014 tournament will take place). It's been downhill since then for Uruguay. If Uruguay can get a win in its opener against France on June 11, then they should move on. That match should be one where the yellow and red cards are flying as both teams like to play rough. Did you know that Nigeria has about 1/6th of the African continent's population? Shouldn't they be able to field a really good squad? Sadly, Nigeria seems to live up to its expectations. The Nigerians have made the second round twice and never gone any further. There is a lot of talent on the team, but it never seems to be quite enough to get the Nigerians too far into the tournament. South Korea is playing in its eighth World Cup. With the exception of 2002, when they were playing at home, the South Koreans have never made it out of the first round. They probably won't get far this time either. Greece won the European championship in 2004. Never figured that one out. The Greeks are not an overly talented squad. Nor are they particularly exciting to watch. Greece plays South Korea in Port Elizabeth in a match that will start at 4:30 am PT. I would advise sleeping in. The group that most people will be paying attention to features the USA, England, Algeria, and Slovenia. The USA and England will meet in the World Cup on June 12 at 11 am PT. It will be their first meeting in this stage since the historic 1-0 upset by the Americans over the English in Belo Horizonte, Brazil in 1950. This time, Rustenburg, a city with an altitude around 5000 feet, will be the site. The Americans will be happy with a tie and so would the English, although not openly. England is the favorite to win the group. The English have not played in a World Cup that was held in the winter (i.e., a Southern Hemisphere site) since 1962. The English are known for wilting in the heat. Their only World Cup win came in England in 1966. Team captain Rio Ferdinand will miss the tournament with a leg injury (as will David Beckham, but he wasn't going to be much of a factor anyway), but as long as Wayne Rooney stays healthy, the English will have one of the most potent players in the world on their side. The English coach is an Italian, Fabio Capello, and, by most accounts, is one of the most beloved figures in the game. Unless the English lose. Team USA will probably give its fans several gray hairs. 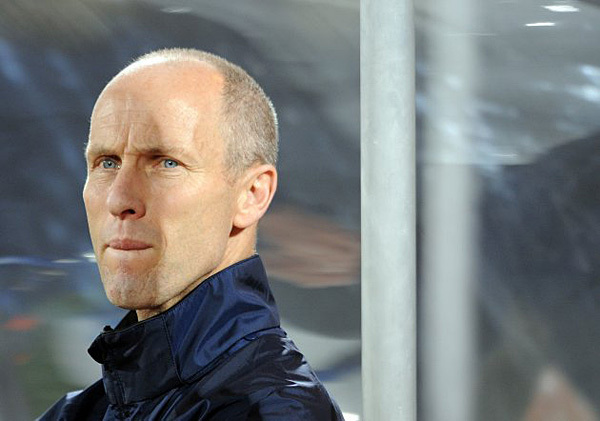 (Coach Bob Bradley is going for both gray hair and no hair.) The team is shaky on defense, which means that no lead is safe. During most World Cup matches played by the U.S., you keep waiting for something bad to happen. As my mother once advised, "Always expect the worst, that way if something good happens, you'll be pleasantly surprised." Mom had a unique way of being encouraging at times. The Americans did beat Spain in South Africa last year and led Brazil late in the Confederations Cup, so there is some hope. Three local MLS players are on the team: Landon Donovan and Edson Buddle of the Galaxy and Jonathan Bornstein of Chivas USA. Most of the US team plays for overseas clubs. Donovan played for Everton during the MLS offseason. Algeria made the World Cup after winning a heated playoff against Egypt (if you understand "heated" to mean widescale rioting that forced the match to be played in the more peaceful location of Khartoum.) Algeria has not played very well since making the World Cup and has some starters suspended for their first two matches for receiving red cards in the African Cup of Nations. Slovenia is the smallest country in the World Cup. It has a population smaller than Los Angeles, just a little over 2 million people. Slovenia beat Russia (which has 72 times as many people) in a playoff to make the World Cup. Slovenia is not Slovakia. Good grief! Normally, Germany would be the favorite in this group. But the Germans lost their best player, Michael Ballack, to an injury, and they will find goals much harder to come by without him. I would advise watching all German matches on Spanish TV. Why? Because it is really cool to hear "Bastian Schweinsteiger" in Spanish. Ghana made the second round in 2006, but will be without their star, Michael Essien in 2010. Ghana's team went from "Wow!" to "Meh!" without Essien. Australia qualified as a team out of Asia. This may confuse you if you look at a map. Australia used to play other teams in the Pacific, like New Zealand, Fiji, and American Samoa, and beat them so badly so they picked up their continent and moved it. Expected to move on: Serbia, Germany. Nobody beat the Netherlands in qualifying. In fact, nobody even tied them. The Dutch are always among the best teams in the world, but they've never won the World Cup. They finished in second in 1974 to Germany and in 1978 to Argentina. A semifinal appearance in 1998 in France is the best the Dutch have mustered since then. This year's team looks like it has enough to get to the semifinal again, but the Dutch may not have Arjen Robben, who hurt a hamstring in training. Japan is appearing in its fourth straight World Cup. The Japanese have only made it out of the first round once, back in 2002 when they played at home. Japan usually has a lot of fan support overseas, but they don't play well away from home. Denmark is a solid, but not flashy team. Denmark's biggest moment in soccer was winning the European championship in 1992. This is not 1992, however. The Danes are not going to overwhelm the opposition with dynamic play. They have to hope they screw up less than other teams, which only gets you so far. Cameroon made a big splash in the 1990 World Cup making it to the quarterfinals. They eliminated Argentina in the opening round and upset Colombia in the second round before falling to England. Cameroon has made three more World Cups, but hasn't been much of a factor. Samuel Eto'o is one of the top players in Europe, playing for European club champ Inter of Milan. Cameroon's teams go by the nickname of the Indomitable Lions, which really should be worth at least one extra point in group play. Defending champion Italy is the top seed in this group. The Italians aren't considered to be much of a factor in this year's tournament, but they should win this group, which is pretty weak. The Italians are seldom artful, but they are always organized. Paraguay lost star Salvador Cabañas to a bullet in the head in a bar in Mexico City. (Just how it happened is still a matter for the authorities to decide.) Cabañas has survived and is out of the hospital and doing pretty well, but he won't be playing in South Africa. The rest of Paraguay's team has been uninspiring in preparations for the World Cup. Slovakia surprisingly qualified for the World Cup, upsetting its old roommate the Czech Republic. This will be Slovakia's first trip to the World Cup finals. They have a pretty good shot at moving on from this weak group if they beat Paraguay. Remember Slovakia is not Slovenia. Group G aka "the Group of Death"
Five-time champion Brazil is the main attraction here. However, the Brazilians long known for playing an artful and attacking game, have switched over to the philosophy of defense first under unpopular coach Dunga. Brazil was knocked out in the quarter-finals in 2006 by France and the fans of Brazil demand a better showing. But, they also want the game to look nice. Dunga is offering Brazil the choice between winning ugly or living fast, dying young, and leaving a beautiful corpse. This is a very tough choice for the average Brazilian fan. Portugal will be one of the challengers to its former colony (and the place where the Portuguese royal family fled to in the 19th Century, establishing the last monarchy in the Americas.) Portugal features Cristiano Ronaldo (or sometimes just Ronaldo, don't confuse him with the Brazilian star), the highest paid player in the world (just how much he makes is not exactly known, but supposedly he has a buyout clause from his contract with Real Madrid for one billion Euros.) However, the team has had trouble jelling under coach Carlos Queiroz. Portugal finished in fourth place in 2006 and has the talent to win it all. Or flame out early. Ivory Coast, aka Cote d'Ivoire, was Africa's best hope for a run at the title. Didier Drogba is the best player among his country's so called "Golden Generation." Unfortunately, the Chelsea star broke his arm last week. But, he claims he may still play in the World Cup. Ivory Coast has little to show in the way of championships. The Ivorians were eliminated in the first round in 2006. And this group is brutal. The team may benefit from playing relatively close to home. Or they may realize that they are playing Brazil and Portugal and make enough mistakes to get them eliminated. If Drogba is able to play, Ivory Coast has a chance, but it looks dicey now. I'd short your Ivory Coast stock. Except everybody else already did. So you're stuck with it. Everybody's unsentimental underdog, North Korea, rounds out this group. Unsurprisingly, not too much is known about the team. Not too much was known about North Korea when they made it to the World Cup in 1966 and upset Italy and almost beat Portugal. North Korea is expected to go 0-3 and head back home. Since it's hard enough to travel from North Korea to South Korea now, there won't be many, if any, North Korean fans in South Africa. North Korea reportedly has hired troupes of Chinese actors to fill in as fans for them. Presumably, the actors will get paid in Chinese currency. South Korea and North Korea are on opposite sides of the draw and could not meet until the finals. They played each other in qualifying. South Korea won 1-0 in Seoul and the other match was a 1-1 draw in Shanghai. The tournament favorite, Spain, is the class of this group. La Furia Roja have lost only once since 2006, a 2-0 loss to the U.S. in the Confederations Cup last year. The Spanish start world class players at every position. They will possess the ball for most of each match they play. Although Spain has one of the strongest domestic leagues in the world (La Liga) and features two of the sports most famous clubs in Barcelona and Real Madrid, the Spanish have generally been flops on the international stage. However, the Spanish did win the European championship in 2008, the nation's first big international trophy. If Spain cannot win the World Cup this year, it's time to start dressing them in blue and white and making them wear a blue cap with a red C on it. Chile is the likely second place team from this group. The Chileans score a lot. They also give up a lot of goals. So, if you want to watch a game with a lot of up and down action, Chile is your team. Switzerland makes the World Cup fairly frequently. It's their ninth trip. The Swiss have not made it past the second round since 1954. The Swiss won a rather easy qualifying group in Europe, so they haven't been challenged much. Swiss fans are surprisingly partisan. And they have cowbells. Honduras, beset with political strife at home, made the World Cup thanks to a miraculous last minute goal by Jonathan Bornstein of the U.S. in a qualifier against Costa Rica in Washington. That forced a draw and kept Costa Rica out of the tournament. Honduras made the World Cup in 1970 and 1982. Like those two years, Honduras will just be happy to be here. In 1982, Honduras did tie host country Spain in their first match. If that happens in 2010, then someone will have someone explaining to do. Predicted to advance: Spain, Chile. Predicting the knockout rounds would be even more guesswork. Spain remains the favorite of oddsmakers with Brazil the second choice. Spain and Brazil are on opposite sides of the draw so they could meet in a dream final. Spain versus England is another highly anticipated final. Recent history shows that the final four teams usually have one dark horse. In 2006, not many expected France and Portugal to meet in the semis. In 2002, South Korea and Turkey were unexpected interlopers. In 1998, it was Croatia. In 1994, Sweden and Bulgaria made unexpected runs to the semis. However, the final almost always features two traditional powers. Spain is looking to join one of the most exclusive of international clubs. Barring an unexpected major injury, the Spanish should become the first European team to win a World Cup held outside Europe. Previous blog post: The Pac-16?